EWHURST PARISH EVENTS: Last minute and gentle reminders of three (3) varied but very interesting social events that will take place this week-end. Event No: 1- STAPLECROSS ART EXHIBITION - The amazing talent of the combined groups of Staplecross Art Group and her sister group the Hollington Art Group can be seen in all their colour, splendour, variety and skill when they hold their bi-annual Art Exhibition. This show will be held at the Village Hall, Northiam Road, Staplecross TN32 5QG., over THIS WEEKEND - Beginning with TONIGHT - Friday April 27th during the evening between 7pm and 9pm. Also on Saturday April 28th all day between 10am and 4pm with a repeat opening on Sunday April 29th again between 10am and 4pm. Entrance is free and everyone will be assured of a very warm welcome. Come along and be astounded at the high level of skill, talent and colour is exhibited here. Event No: 3 - WINE TASTERS @ EWHURST: If like many of us within the parish, you enjoy a delectable glass of wine now & again, then why not consider joining in the monthly Wine Tasting at Ewhurst. This is a super little social group of like-minded people who enjoy a couple of hours per month tasting and commentating on a selection of wines - plus bread and a few nibbles -all wrapped up in good company in a cosy venue, that being the Herdman Pavilion in Ewhurst Green, (TN32 5TB) The April Wine Evening gathering will be held on Friday April 27th from 7.30pm to 9.30pm.- AGAIN, THAT’S TONIGHT! - No membership is involved, just a matter of advising the host if you are attending - this ensures there is sufficient wine for everyone to enjoy! £5:00 per person is all that is required upon arrival. If you think this is of interest to you, please contact Janis via her email - janhooper3@hotmail.co.uk to learn more about this friendly and welcoming group. We are very friendly group of people and will certainly make sure you have a very warm welcome upon arrival and a glass of superb wine in your hand, very shortly after !. ROTHER RAMBLERS: Continuing their ‘out & abou’t strolls around our lovely countryside, the members of that popular walking group, - the Rother Ramblers have organised two (2) more walks for our enjoyment this week. Both walks are not quite in our area, but may still be of interest. Walk No: 1 is planned for Saturday April 29th and is an 8.5 Southease to Rodmell circular walk. The meeting point is “Itford Farm”. OS.EXP233. TQ434056. (satnav BN8 5JS). The walk notes state to park along the road between the farm and Southease Station, or in the lay-by on the A26 opposite the farm. As usual, a picnic lunch is suggested. Rita and Clive are to be your ‘walk leaders’ and you may contact them on: 01424~88267 or Mobile: 07969~446867 for the meeting time and for all further details. Walk No: 2 is arranged for Thursday 3rd May and will be an 8.5 mile circular walk from Chailey to East Chiltington. OS.EXP135. TQ394189. (satnav BN8 4DA) at the normal time of 10.00am. Martin will be your ‘walk leader for this outing and you may contact him on: 01424~752793 for more information. 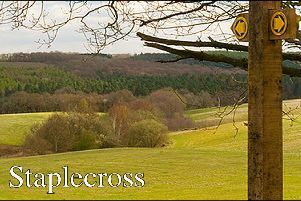 STAPLECROSS & EWHURST GREEN W.I. : Looking forward to continuing to enjoy all that this local branch of the W.I. has to offer, the members of our popular village W.I. group will be meeting again on Tuesday May 1st. in the Village Hall, Northiam Road, Staplecross,TN32 5QG.- beginning their meeting at 2.00pm. This month will be when we all decide which of the ‘Resolutions’ we wish to support and send to the Annual National Assembly for submission to the Government for consideration. Following this discussion, we will also have another entertaining speaker in the form of Mrs Jane Muddle, who will be explaining “What’s Behind the Bags & Hats of Madagascar”. - this subject, like many others undertaken by our W.I. will no doubt give rise to much discussion in a lively but always friendly and respectful way, - which will be enjoyed more so over the delicious legendary ‘WI Tea’. New members will always be given a warm welcome and for more information please contact Ann on 01580~831944 who will gladly tell you what is on our Calendar of Events and what to look forward to throughout 2018. PRAYER MEETING: These simplistic, genuine and friendly meetings take place twice a month - on the 1st and 3rd Wednesday at St. James the Great, Ewhurst Green at 7.00pm. The next date for these meetings will be Wednesday May 2nd. at the usual time of 7.00pm. As well as prayer, many issues are reflected upon within the group. Those who would like to know more of these little prayer meetings and what they entail, please contact Sue on 01580~830251 for more information. CHURCH SERVICES: Church services for the parish of Ewhurst, will commence at St. James the Great, Ewhurst Green on Sunday April 29th. Easter 5. at 9.30am. This service will include Holy Communion. (BCP) There will be NO SERVICES today at BOTH St. Mark’s church, Northiam Road, Staplecross AND St. Giles church, Bodiam. If there is any church matter on which you feel you may need further assistance, especially Baptisms, Weddings and sadly, Funerals, then do please get in touch with the Priest - in - Charge, which is of course our new friend - Canon Christopher Irvine on 01580~830925. Help in some way is always at hand and always so generously given, so do please contact him. ANY NEWS FOR THIS COLUMN: PLEASE CONTACT ME: The weather at present is continuing to baffle us, sending us wonderful, warm and summery weather which always makes us happier and in better frames of mind for a few days and then returning us all to another period of cooler, colder and altogether more depressing weather which in turn makes us miserable again ! Life in and around our villages and community is far from being dismal & dormant as lots of societies, groups and sports clubs plan functions for the better weather. Lots of events are being planned for our enjoyment so if you are arranging an event in the foreseeable future, --- whatever the nature of the event and however large or small, and you’d like some extra free coverage for it, -courtesy of the Observer Newspaper - then please get in touch. If it’s of interest to you, - it’s of interest to us. It’s never too early to send in any of the details and to tell us what you are arranging. So please do contact me, as I’d love to hear from you and to help ‘spread the word’ on your behalf. ..........Thank You.